To give that a wider airing, this post sets out the ways in which you might find it helpful to refer to Pivotal Tracker, and gives you a basic orientation as to what's what when you fire it up. Pivotal Tracker is one of many online, agile project management apps used by software development teams to collaborate and track their work. It contains our product backlog - a prioritised list of features we plan to work on in upcoming sprints - and also holds a long list of known bugs and potential other new features yet to be prioritised. Done shows all the tickets that have already been delivered, right back to September 2011. Current shows what we're working on in the current sprint. Tickets with a green background are done (on preview, if not yet deployed to production), yellow are in progress, grey are queued to be started. Backlog shows prioritised stories for the subsequent 1.5 to 2 sprints. The order of these may change right up until each sprint starts. Icebox shows accumulated feature requests and bugs that are yet to be prioritised, grouped thematically. We have a lot of these, and many will never get done. These tickets are in approximate order of priority within their respective groups: the ones at the top of each group are more likely to be picked up in future sprints than those at the bottom of each group. Epics is effectively our product roadmap, listing the big deliverables that we would like to deliver in approximate priority order. The thematic grouping of icebox stories corresponds to these epics. If you have an idea for a new product feature, or an iteration to an existing one, or if you spot a bug, the first thing we'd hope you do before contacting us is to search Pivotal to see if we've already got a ticket on the backlog. Try searching for a few different terms in case we haven't called it the same thing as you would have done. If you can't find a ticket that corresponds to your feature request or bug, then by all means get in touch using the support form. a link to the Pivotal ticket in your message. 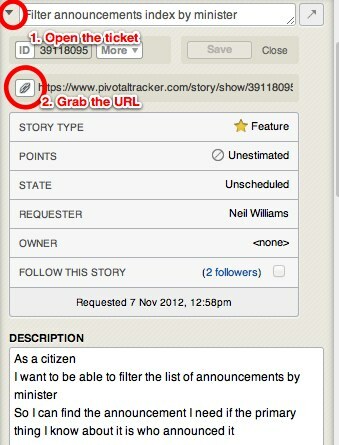 To grab the link for a story, click the arrow next to it and then the link icon for that story (shown below). evidence of why you think it's important for end users that we do it sooner. It helps us to help you faster if you can supply both of these things. We'll cross-refer your support request to the Pivotal ticket so that we let you know when the feature/bug fix is delivered. We'll often give you a link to a Pivotal ticket in response to a support request, for example if we agree with your suggestion for a new feature. When you access a ticket directly at its URL you get taken to a full-screen view of that ticket. Click the diagonal arrow in the top right of the ticket to collapse it and see where it is in the overall list of tickets we're tracking. This will reveal where the ticket is - in the backlog or icebox, and its position relative to other tickets in the sprint or icebox group. The "Epics" list is the easiest way to get a sense of the higher level improvements and new features that we hope to introduce over time. If you look at nothing else, I'd encourage you to look through this epics list. They are grouped under headings of in progress, next, soon, someday and maybe. This gives you a sense of relative priorities, which you are welcome to challenge us on if you disagree. We deliberately avoid putting dates on the roadmap. Being agile means we shift priorities continually as we learn more about what will deliver the most value for end users and publishers. Talking about relative priorities instead of dates is an important part of that - it's an evolving plan, not a commitment. I hope you found this a useful tour. If there's an aspect of Pivotal (or how we're using it) which confuses you or something I have neglected to cover, please do comment and I will gladly clarify. Big follower of Pivotal Tracker - I've found it extremely useful and would encourage everyone to check in every day or so. It's always interesting following the conversations between the team on a particular story. Sometimes it would be really useful just to add something in too, without having to go through the process of raising the support ticket. Any thoughts of letting others be able to contribute to Pivotal. Totally understand if it's a 'no'. Hi Neil - yes, this is very useful. I felt lost trying to feel my way around Pivotal Tracker. It would be helpful to have a definition of a 'sprint' - you talk about sprints a lot, but I have no idea what it means. I work on projects, not sprints. Am I sprinting too? Elizabeth - glad it's useful. Sorry for the unexplained jargon. Sprint is a term used in Scrum agile project management methodology. It's a specified period of time in which the team (usually short - ours are 2 weeks) will deliver a defined amount of work. See http://en.wikipedia.org/wiki/Scrum_(software_development)#Sprint for a much better definition! Thanks John! I like the idea of others being able to contribute ideas more directly and without using the support form, but not keen on that happening directly into our daily working tool. It's crowded enough in there as it is. I'm keeping my eyes peeled for a tool that might meet that need. Suggestions welcome. Not used in myself, but I've heard some good things about Wazoku. Think it's on Cloudstore, too. Can users set up as "Viewers" follow stories to get email notifications on updates? I'm thinking how best to keep track of stories relevant to us - many of our Zendesk tickets are closed when they graduate to Tracker, so we lose that ability to quickly monitor our raised issues. Hi Tom - we used to close Zendesk tickets when we started tracking a request in Pivotal, but about a month and a half ago we changed our process so that we keep both tickets open, cross-refer them to one another, and make sure we update you via Zendesk when there is progress on the Pivotal ticket. Great article. I would love to know how you handle your QA process with Pivotal Tracker.